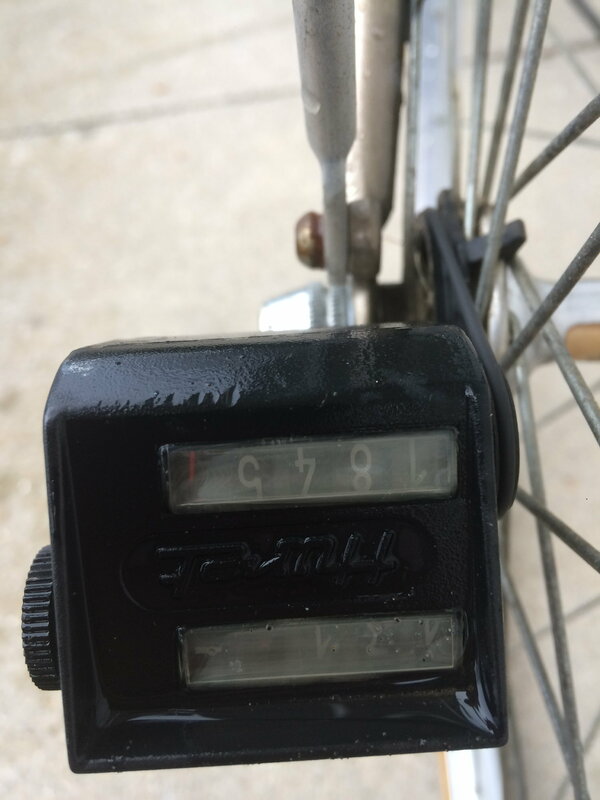 Hmm, I picked up a 1987 Specialized rockhopper for $45. Sold the derailleurs and picked up some cheapy replacements so I'm $35 into the bike so far. This will make a fine commuter. 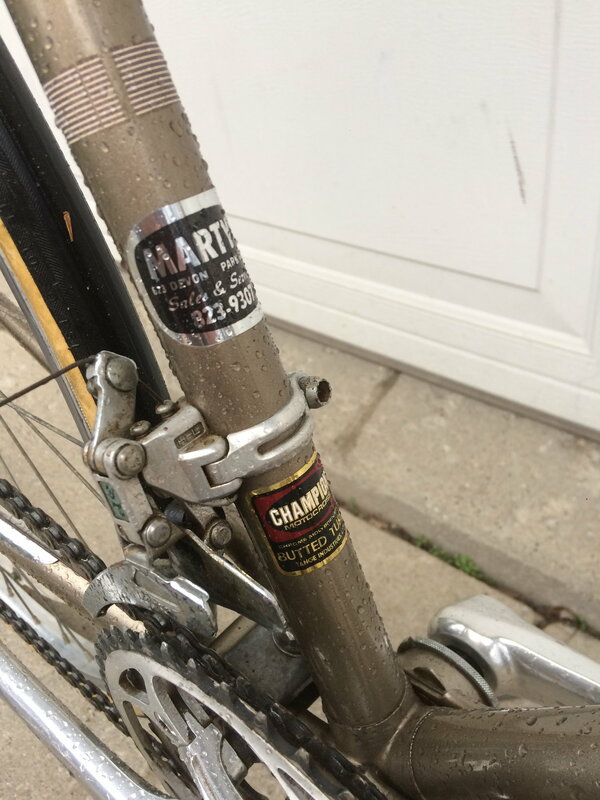 So, because the Jeunet is not secured yet and I have nothing else to contribute, I'm turning the Fuji Cambridge VI into my unofficial official Clunker # 5 challenge bike. At the least, its turning into an interesting placeholder. ...without any of the other cooler features the CCM had. Other than that, it has forged-ish looking stamped steel dropouts, some secure looking lugs, and dates to the early 1980s. Like a rescue animal that bites the hand, this one has thwarted my attempts to save it from a 100% scrapyard doom by throwing me a frozen seatpost AND stem. But I know it's just because it still feels unloved. I got the seatpost out with some coaxing, but that stem is going to be a tricky beast. I want to actually save it and use it (since it was free and will contribute nicely to the status quo so far) and since so much is sticking up, my plan is to cut it off near the base and 'shorten' it for use later by grinding down a new wedge angle on it. With it cut down, I will also gain access to pounding out the wedge, which may be contributing to the problem. HOWEVER, the headset nut is also stuck, and so I don't want to cut anything before cracking that sucker loose, so it is all soaking with some penetrating oil after a few good whacks with a mallet. Hopefully will have a fun update at some point, either with some stem action going on, or even a new bike in the shop! Last edited by AdventureManCO; 04-07-19 at 08:56 PM. I believe @Narhay has a special Clunker Concours d elegance division for just such an entry I for one love a nice Moto GT as I own a 78 and I would never use the C word to describe it. Pictures please. I had a 1980 UO-10 too. @AdventureManCO I hope the Fuji stem issue is resolved to your satisfaction I have always liked a good camel-back top tube. I just figured out that I actually have a perfect candidate for this particular challenge. I bought this thing last autumn for the equivalent of about $80. If anything, it might be a bit too clean and neat for a clunker, but then again, it's not exactly top-of-the-line either. This, combined with LBS's special price, only for you my friend Continental Ride Tours, should be the ticket for doing a hundred by hundred. I actually took a decent drive-side pic of it, but looks like the forum does not allow me to post a picture or an URL until I've posted ten messages. 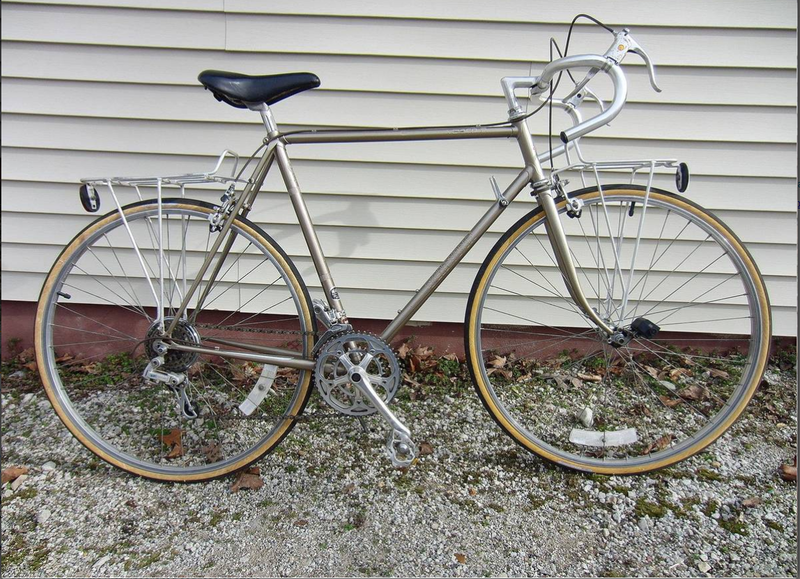 @eeuuugh, I came very very close to buying that exact model Azuki as my first bike-store-purchased 10-speed in 1975, but I wound up instead going with a Dutch Batavus Tour de l'Europe instead. @ryansu, that is a stunning Trek 520 and I am deeply jealous! That is a lovely bike! No pix this time, but I have successfully cleaned and repacked the BB and the headset and am grateful for bearings in retainers. A shocking amount of crud came off this bike, but it is interesting to see how little it appears to have actually been ridden. 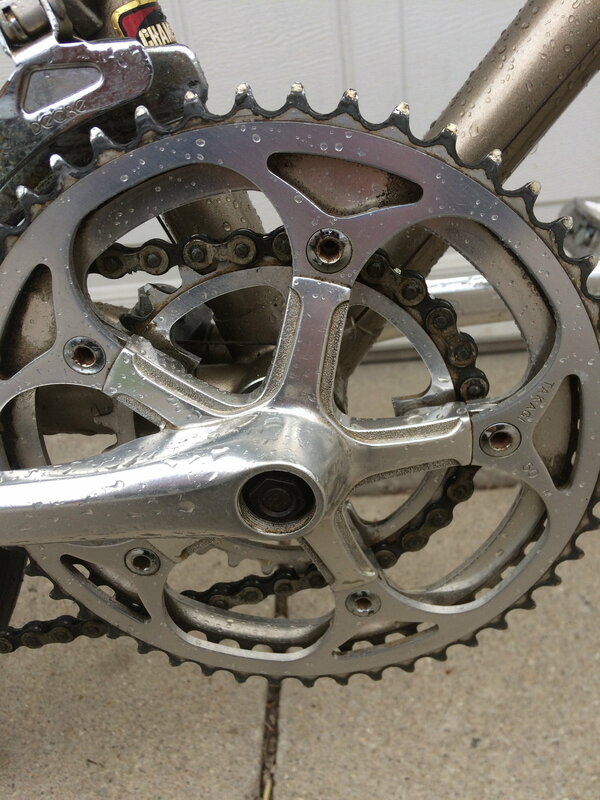 Finally, I will need to find the proper removal tool for the Caimi (later Everest) freewheel, as none of mine fit. Thanks @rustystrings61 I am pretty excited about the 520 and have already ridden 6 km with more planned for this week I rarely find a deal like this. I have yet to pull the Araya out of storage, but this season's challenge looks off to a great start! Merci beaucoup! I’m going to need it. Looks like in order to keep costs at a minimum, this will have to be an all out build up from the ground up. So far it’s calling for my first ever efforts to build a wheelset. And that’ll be calling for my first ever effort to overhaul hubs! Bit of an undertaking in light of a deadline. Hard to tell exactly. Caliper readings are all over the place, but it seems to be either 26.4 or 26.6 mm. And I don’t currently have a stash of posted in hand to test it with. I’ll have a better idea once I prep it a bit. Mysterious French ID? AND a little bit disturbed! Cambridge VI update: Got the headset nut loose. Turns out, hammers really work. The top bearing race nut was the hardest thing to get off. Frozen on with rust. Had to use vise grips and, well, a hammer! Hammer saves the day. Next up, cutting off the ridiculously long stem so that was I can pull the fork out and work on it away from the bike so I don't goof up the frame pulling out the big hammers. The bike is giving it to me rough, so I'm giving it right back. Fun times! Hmmm! My project bike just told me it felt undeserving to be in the same technical company of your bike. Please, for the sake of mine, take some hammers and sandpaper to that thing! wow that's a super nice Peugeot mixte! Forged drops!? Either forged or rather cunningly pressed. I'll take a better look next time I visit the garage. The bike was a bit of a lucky find - the seller told they bought it new, then rode for some years, bought something nicer and put it away in the shed. I found it from the local Craigslist equivalent. 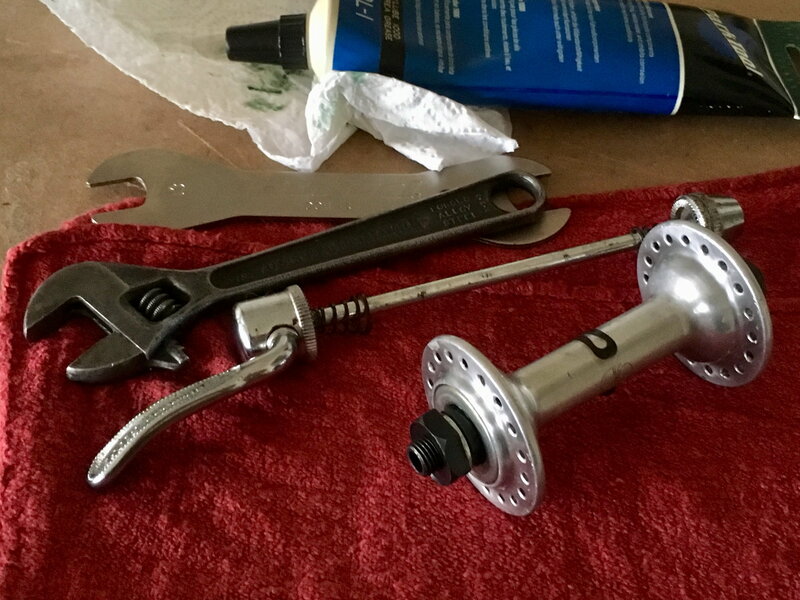 The front hub is a Maillard and came apart today. It was dry, the grease in it had turned into a resinous substance and the cones have seen better days. When putting it back together after cleaning I really couldn't get it to a) not bind in some wheel positions and b) not have slack at the same time. I may give the hub another disassembly and cleaning to see why it binds. It didn't look that bad... but then again, before disassembly it was almost impossible to turn by fingers. Also the Nokia-branded front tyre was really hard to remove - I had to actually use tire irons to get the bead off the rim. Rear tire is a Michelin, probably original. Both wheels are slightly out of true. I've successfully made a couple of seriously out of true wheels a bit more true before, but dunno really how much I can improve these. Other specs include Weinmann Vainqueur brakes, Weinmann drillium brake handles and some late-model Positron push-pull cable rear derailleur with a five-speed freewheel. Last edited by onre; 04-09-19 at 12:15 PM. The front hub is a Maillard and came apart today. It was dry, the grease in it had turned into a resinous substance and the cones have seen better days. When putting it back together after cleaning I really couldn't get it to a) not bind in some wheel positions and b) not have slack at same time. I may give the hub another disassembly and cleaning to see why it binds. It didn't look that bad... but then again, before disassembly it was almost impossible to turn by fingers. Sounds like you’ve got a real clunker! Good luck getting the Maillard in good function. I also rebuilt a hub for my project. 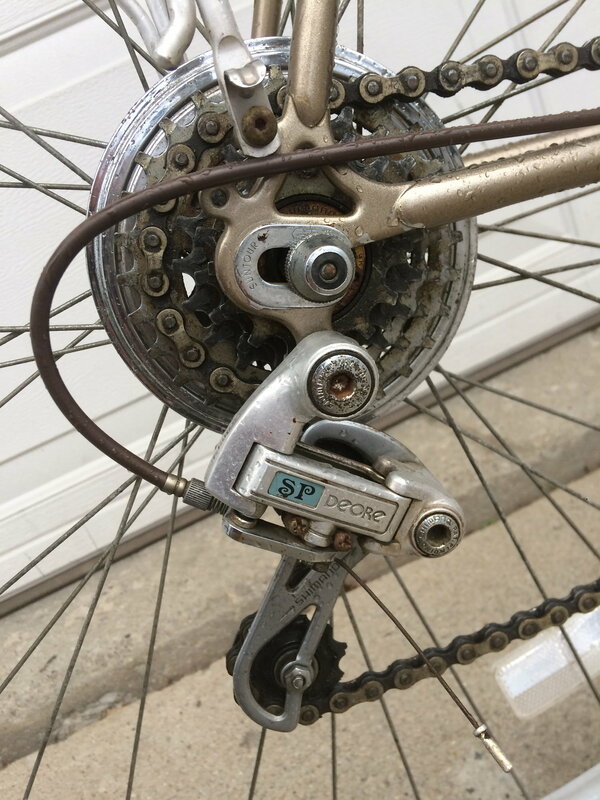 I had a set of early Shimano which came from the Box O’Crap. Like your Maillard, the front didn’t like spinning at all. Luckily it’s in good service now. The rear spins fine, but I can feel the drag of old grease so it’s currently apart for the same treatment. Lacing them up should prove be interesting as I’ve never tried to build a wheel before. like rebuilding a wheel, that we've never done before, because the fees from the LBS will push our cost up to high. The rules say that soap, WD40 and grease don't count for cost. But what if I need to buy a few tools? So I could do some work myself. "time, tools, cleaning supplies, gas/transit to go get it and grease are free." Last edited by Rocky Gravol; 04-09-19 at 05:24 PM. I have never done that (yet) either I have a book on how to I bought probably 5 years ago and plenty of bits to probably do it but haven't done it yet. You might try Sheldon's site on wheel building as a start and there is probably stuff on You Tube. Good Luck!! It's really not so bad - but what's fun is to do it Clunker Style (wait - shouldn't there be some cheesy dance to go with that?). 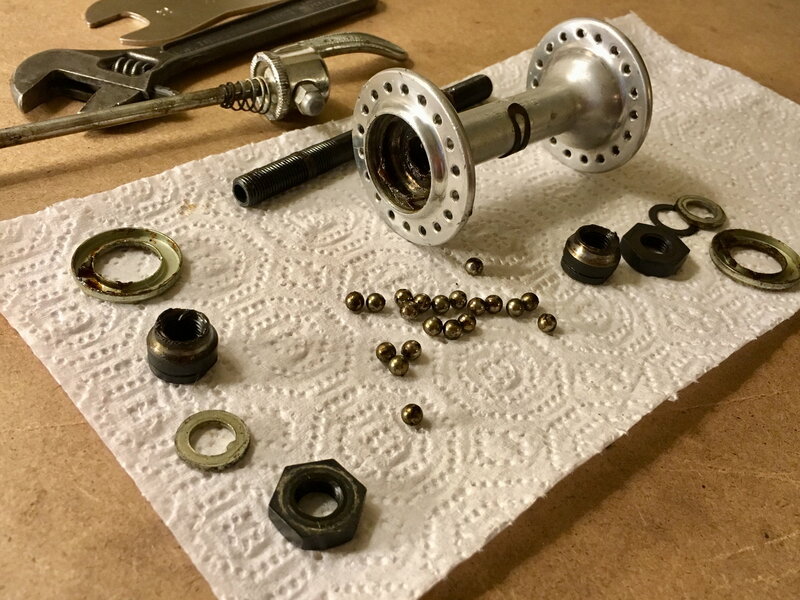 My contender for that, which I no longer own, was a used 32h high-flange Formula fixed/free hub scored on eBay for $20 that I laced to a scavenged 32h Campagnolo tubular rim with spokes rescued from a 36h Specialized hub/Mavic MA40 wheelset I was given because the flanges had failed and multiple spokes were flopping around free. Somewhat sadly, both these bikes sold quickly. I was surprised the Mizutani sold, seller had it posted since last fall. This Voyageur popped up on the radar this morning, seller asking $45. I'm not a religious man, but please send all prayers and karma bubbles and whatever that (a) the post is real and (b) I can get there before someone else does! This would make one heck of a clunker. There's a certain cultural difference thing going on here. 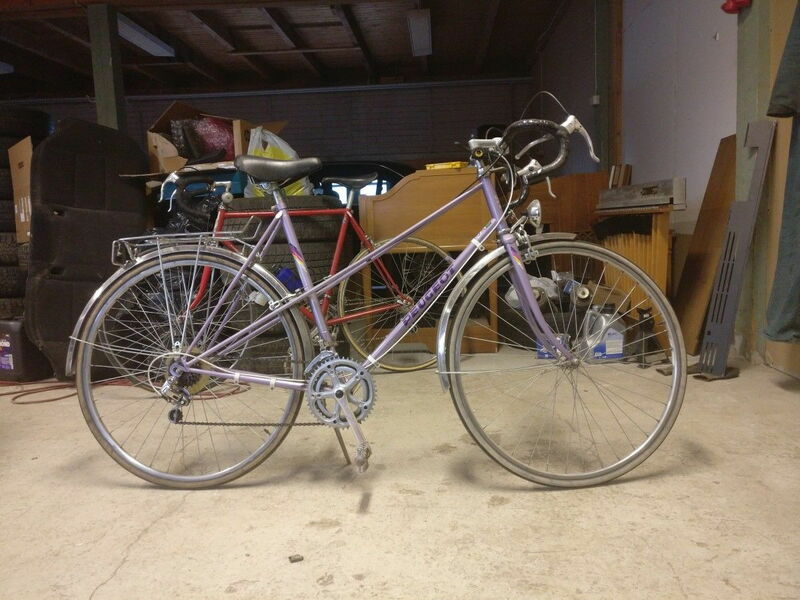 The average sub-$50 bicycle in Finland would never have a lugged frame, instead it would be a heavy domestic Dutch-style thing from the bygone days - or a '70s five-speed with a Fauber bottom bracket. I'd say a large part of the fun in this challenge comes from having to do stuff one hasn't done before. Looks like I get to actually adjust and use a Positron system instead of just replacing it with something normal. You MUST get that Voyageur !! I am still looking for a bike for the challenge. I looked a 3 that will work nothing high end and they are rough the owner was not home so I couldn't make a deal. They were a Fuji Absolute, Motobecane Mixte and Specialized Hard rock. 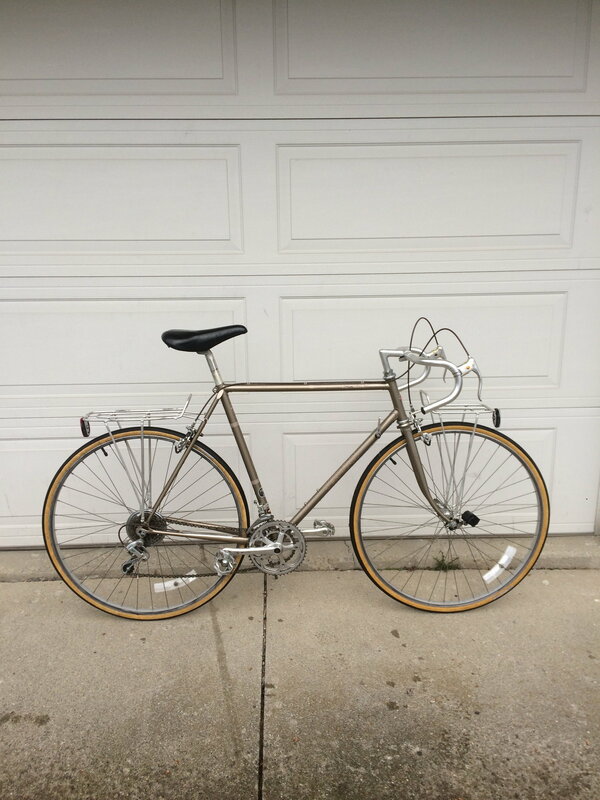 My official entry in the clunker challenge: 1983 Schwinn Voyageur. $45 delivered to my house and the guy wouldn’t take any gas money. 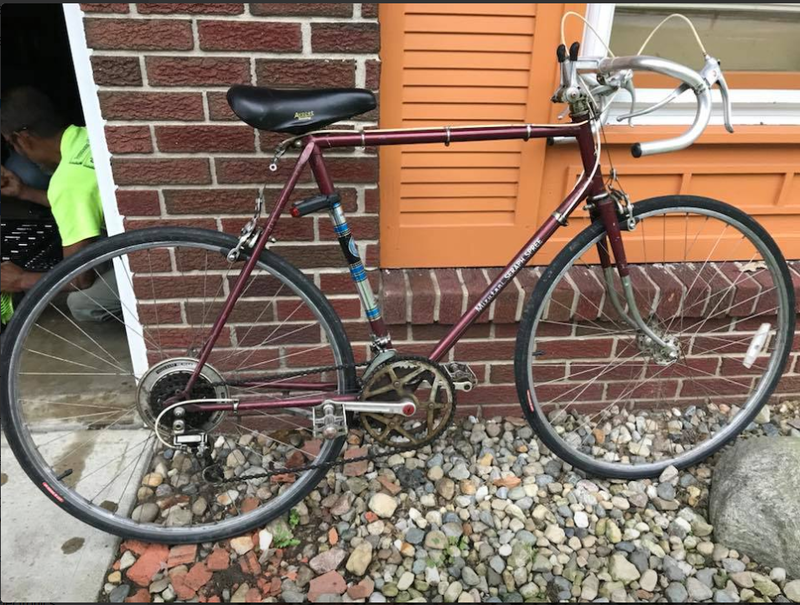 Said it was hanging in his neighbor’s garage for years and the neighbor was going to trash it so seller took it off his hands but is not in physical condition to ride a drop bar bike. I’m not sure what my game plan is yet, I was not expecting to get this bike. Been lusting after one of these for several years. I’m gonna start a separate thread on this one I think. FANTASTIC deal, and the bike is clean, to boot.